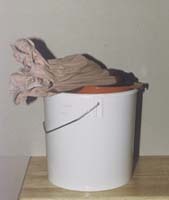 Dispose of the bag containing the Madder Root, gather the cloth containing the liquid and secure it tightly, (use string or some such device), lift it out carefully while holding it over the bucket and slip a clean sieve under the bag, resting the the sieve containing the bag on top of the bucket. There it can drain without any further activity on your part. 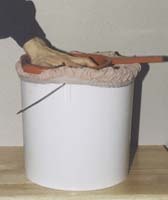 If at this point you want to squeeze the bag, do squeeze it into another clean bag before squeezing the second bag into the main bucket. I cannot stress enough how important it is to keep sediment from the Madder Root out of the strainings. It muddies up the end result.